The 2018 BC Provincial Cups started with a bang last week, as the preliminary round of the Keith Millar B Cup took centre stage. 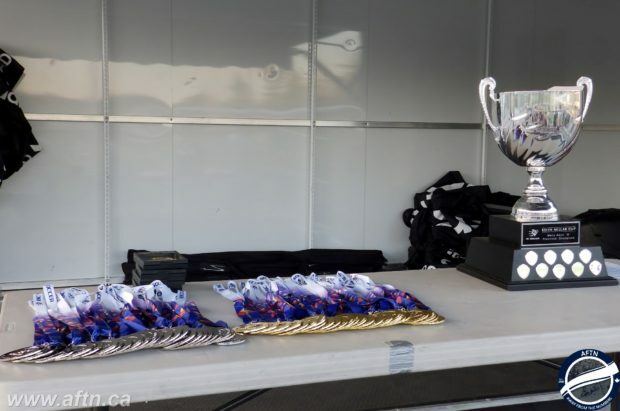 There were some surprises along the way, Richmond Adult Soccer Association (RASA) teams produced the goods, and those two things combined to send defending champions Vancouver Greencaps crashing out of this year’s competition at the first hurdle. Despite being defending champs and VMSL Division 2B winners, the Greencaps were drawn into one of the eight preliminary matches last weekend. That saw them heading to Richmond on Saturday afternoon to take on RASA side, and former Provincial B Cup winners themselves, Richmond All Blacks at the Minoru Oval. The All Blacks were runners-up in the RASA First Division this past season, finishing five points behind champions West Coast FC, and they fought hard against their VMSL opponents, who were clear favourites heading into this one. After going 1-0 up the turning point came when they saved a Greencaps penalty. If the ‘Caps had scored, you fancied them to go on and take this one. They didn’t, Richmond added a second, and they moved into the next round with a 2-0 victory, where they will head to the island to face the Gorge-Us Guys. Imagine a ‘Caps side not scoring! They were joined in the next round by fourth placed RASA side Graduates, who pulled off their own mini-surprise with a 3-1 win at fourth placed FVSL side Langley Utd Sparta. That sets up a meeting with RASA champs West Coast and guarantees at least one Richmond team in the last eight. FVSL side Mission FC got this year’s cup underway on Friday night, coming away with a fantastic 1-0 victory over Metropolitan FC. The VMSL side should have been out of sight by half time, but their inability to bury their chances cost them dear. Mission got the only goal of the game around the hour mark, firing home a rebound from a saved header off a free kick. Metropolitan hit the bar in stoppage time, but couldn’t get the equaliser to send the game to another 30 and the FVSL lads advanced. It won’t get any easier for Mission in the next round as they head to face VMSL Division 2A champs, and Division 2 Cup winners, Coquitlam Metro Ford Lupi. Sparta may have bowed out but Langley Utd Dynamo flew the FVSL flag with a 3-1 victory over BMSL side Burnaby Coasters FC. All the goals came in the first half and off set pieces. Dynamo went one up when they fired home off a corner to the back post. The Burnaby side tied things up on a free kick, before Langley added another goal similar to their first and rounded off the scoring with a free kick of their own. It was a different story in another FVSL v BMSL clash on Saturday, with Burnaby’s Sierra FC seeing off PMO Titans 2-0 on Port Moody’s Trasolini Turf. Sierra had the better of the first half without producing much of a scoring threat, but they finally went one up in the final minute of the half on a breakaway goal. Sierra eventually wrapped the tie up with ten minutes left, tucking away a penalty. There wasn’t a happy ending for fellow BMSLers Bacardi FC though, as they went down 2-1 to VMSL side 13th Legion. It wasn’t a good weekend for the island sides. Saanich Fusion Bandits disappointingly forfeited their game against VMSL side Vancouver Strikers, while Gorge FC did play on Sunday, but went down to a 3-1 defeat by Fraser Valley Blue Devils in Abbotsford and only have a squad of 11 players. Those matches set up some interesting ties in the first round proper. Here’s how the draw has played out. There’s definitely a couple of interesting match ups in there. Get out and take in some of the action if you can. Here’s Canucks4Ever from the Take The Piss forum with his preview of all this weekend’s Round of 16 matches (in bracket order). The RASA are on a roll this season. Despite losing a berth due to having fewer teams competing in their league, the boys from below sea level proved that this has not resulted in the quality dropping as both their teams competing in the Preliminary Round knocked off very good FVSL and VMSL teams respectively. Graduates took down a veteran Langley Sparta side rather comfortably 3-1 on the road in their opener and their reward is a domestic match up against RASA First Division League Champions West Coast FC. West Coast enter the competition after winning the league by five points but, perhaps more impressively, having scored an eye-popping 64 goals over their 21 games. That is an average of more than three goals per game and over a third of those tallies belong to RASA First Division top scorer Todd Anderson. Andersen banged in 22 goals, 10 more than the next highest scorer Nicholas Varley who had 12 goals on the season and also happens to be from West Coast FC. The champions clearly have the fire power to make a run in this tournament, but Graduates are not likely to be worried given that the teams split their three league meetings, each getting a win and then adding a 3-3 draw. They did, however, meet for a fourth time in the League Cup final where Graduates emerged as 3-1 winner and booked their ticket to the Provincials, despite their fourth place finish in the league. West Coast are the free scoring RASA Champs, but Graduates seem to have their number and they clearly know how to play knockout football. Make this one my Upset Special; Graduates to carry their momentum to the quarter finals. Vancouver Strikers were given a walkover in the first round when Saanich failed to show up at Point Grey. Therefore, both teams in this one are coming off “byes” and we will see who is the fresher. It has certainly been a long layoff for Strikers. Their last competitive game was fully a month ago when they were knocked out of the VMSL Division 2 Cup at the semi-final stage, falling 2-1 to eventual champions Coquitlam Metro Ford Lupi. Strikers were unable to repeat the feat that has made them the only team so far this season to defeat Metro Ford, who won the league and couple double. The Vancouver boys will need to recapture the form that inspired them to that victory back in October if they are to have any chance of progressing. Abbotsford are the Coquitlam of the FVSL. They too won the league and cup double after being relegated from Division 1 last season. Abby are entitled to go straight back up but, in the Valley, things are rarely ever that straightforward, so who knows where they will end up playing next season. For now, they are focused on bringing home a Provincial Title to the FVSL; something the league has either never accomplished, or accomplished just once, depending on where ACBC were playing back in 2010 when they won the trophy. The Valley boys certainly are not short on confidence and have the swagger of champions. Having come up clutch down the stretch to win the league title on the last day, they then backed up that performance with a solid 3-2 Presidents Cup win over their local rivals the Red Devils. They have proven they are able to deliver when the stakes are highest. They did this all with a relatively economic 31 goals for in 20 games and without a goalscorer among the top three in tallies for Division 2. Clearly Abby are good overall team and they should be favourite to make the final from this half of the draw. 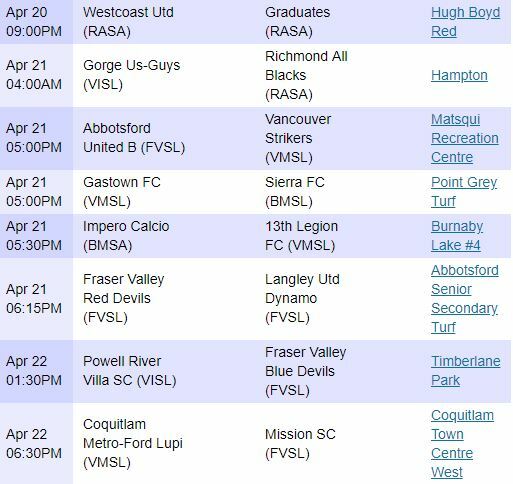 Strikers are the only VMSL team in the top half of the draw, so this will be a good gauge for where Abbotsford stand in the pecking order. If the Valley boys can get past the Vancouver lads comfortably then there is no reason to think that they cannot win it all come May. The Blue Devils used their home field advantage to great aplomb last week as the early kick off out in the Abbotsford had exactly the effect they would have hoped for on their VISL opponents, Gorge FC. The Victoria boys barely fielded a side and Blue Devils took full advantage, running out 3-1 winners. This week, however, the shoe is on the other foot as the Valley boys must make the daunting trip to the sunshine coast to face Powell River. Villa will be keen to represent their league after woeful displays from the aforementioned Gorge and Saanich, who did not bother to turn up at all for their game on the mainland. The lads from the Coast certainly have the pedigree for it as Division 3A winners, dropping only seven points all season and putting up an impressive 56 goals over 17 matches. Their offense is led by league Golden Boot runner up Jake Kenmuir, who bagged 13 of those 56 markers. Powell River has long been known as a treacherous place for mainland teams to play and many top contenders, at all levels of the game, have seen their seasons end there. Blue Devils have proven over the last two seasons that they are never short on confidence. As a Division 3 team last season, they got into the tournament by winning the Presidents Cup and then ousted Burnaby Selects White Eagles, who had won promotion from the VMSL’s Division 2. This would involve a similar sort of upset and while Fraser Valley certainly have the resume for it, with the travel factor, I just can’t see it happening. Red Devils dropped the “Fraser Valley” moniker this season and now play under the Abbottsford SA banner. They were runners up in the Presidents Cup and drew a bye into the second round of the Provincials. That cup run was certainly the pinnacle of their season, as they ended up in sixth place, ten points off the pace at the top of the table and outside the five team pack that was challenging for first place. Langley Dynamo were runners up in the league and these veterans put in their usual tidy performance in the first round, comfortably easing past Burnaby Coasters. While Langley may have had the better league showing overall, Red Devils had the better of the head to head meetings, winning both by a combined 7-3 margin. Domestic derbies are always tough to predict, but Langley do boast a potential game breaker in the league’s leading goal scorer Cameron Whitters. Both sides will fancy themselves favourites, and likely are both in with a shout. I’ll say Langley prevent the three-peat on the season for Red Devils and prove why they finished four places higher up the table. A slight upset as Mission overturned a good, recently relegated, Metropolitan side from the VMSL in their opener. Now the Valley boys make the short jaunt down Highway 1 to Coquitlam. Mission are a plucky, never say die bunch who are always up for a game and rarely see a lopsided scoreline, either for or against. In fact, none of their games this season were decided by more than two goals and even then that only occurred on five occasions. Two lopsided early round Presidents Cup wins are the only outliers to that pattern of scorelines and that would seem to demonstrate a team that is capable of playing up, or evidently down, to whatever their opponent’s level may be. The Valley crew will certainly need that ability to shine through this week as, with due respect to Metropolitan, Coquitlam Metro Ford Lupi are a step up in class. The number of games Lupi have lost over the past two seasons can literally be counted on one hand. They waltzed to promotion from Division 3 a year ago and were barely slowed down in earning a second straight promotion from Division 2 this season. They have lost only once all campaign, led by Eric Dove and Dalibor Plavsic who scored 14 and 10 goals respectively in 20 games. CMF Lupi was born out of the frustration of players who saw something of a “closed shop” mentality of Metro Ford’s senior men’s program, so they started their own team and convinced quite a few talented players, one or two of whom could arguably cut it at Premier, to join them. The results speak for themselves and now, after completing the league and cup double thanks to their shootout win in the Division 2 Cup final over fellow title and promotion winning side Greencaps, will be looking to add the Provincial B Cup to their name in their lone opportunity. Mission will never back down but this would be quite the incredible upset if they were to pull it off. The Division 3A scoring table reads like a Gorge Us-Guys team sheet. Brendan Andrews led the league with 17 goals in as many games, while John Bakowski and Steve Gateley had nine and eight each respectively, plus Liam Leece chipped in with six of his own. That was good enough for four places – first, fourth, fifth and eighth – of the top ten in league scoring. Not surprisingly, they also led the league in goal scoring as a team with 57 goals to their name; one more than Powell River who pipped them to the league title by a mere three points. The Victoria boys will be hosting the All Blacks from the RASA and the Richmond boys proved that they are not to be taken lightly in a first round upset over defending Provincial Champions and recently promoted VMSL Division 2 winners, Vancouver Greencaps. The All Blacks, who were second in the RASA’s First Division but won the league’s year end playoff tournament, are perennial Provincial B Cup participants and have won the title on three previous occasions, but not since 2013. They were finalists the following season, but have since failed to progress beyond the second round, last season going out in the first round at the hands of FC Serbia. All Blacks are certainly a capable side, any team who ends the defending champion’s season by handing them only their third loss of the season in all competitions deserves some respect, but Gorge are not going to be an easy proposition. All Blacks will need to rely on their league best defensive record that saw them only concede 20 time in 21 games this season to stifle the vaunted Gorge attack. This one looks to be a toss up, but travel is always a factor and I think a high flying Gorge team on home turf have to get the edge in this one. Match of the Round here as the Burnaby First Division, Rudolph Cup, and League Cup Champions Impero Calcio host perennial VMSL Division 2 runners up 13th Legion. It’s deja vu for the Legion as at this stage last season they also faced a trip to Burnaby to face the BMSL champions. Then it was Sierra FC, but this season Impero edged them for the title by a narrow two point margin. Impero also got the better of Sierra in a shootout to win the Rudolph Cup and knocked off Burnaby Gunners in the final of the League Cup. It was a clean sweep for the Burnaby boys but now they must welcome competition from the other side of Boundary Rd. It was another VMSL team that ended Impero’s season last year when they lost to Greencaps at this stage of the tournament. This year they will be quietly confident of bringing the title back to Burnaby for the first time since 2014 when the Burnaby South Fighting Irish were champions. Helping them to that end will be BMSL First Division Golden Boot winner Lucas Sweda, who hit the back of the net on 13 occasions this season. Meanwhile 13th Legion are looking for relevance. After bursting onto the season as surprise promotion contenders a season ago, they missed out on going up when they seemingly already had first place locked up. They were second fiddle nearly all season to a powerhouse Coquitlam Metro Ford Lupi side this year and have not even made a Division 2 Cup final since they first became contenders. With no silverware to show for their impressive performances, you have to wonder how long they will be able to keep this group together and performing at this level. A deep Provincial Cup run would go a long way to restoring faith in their program and perhaps they could even take a page out of Greencaps book and use that as a spring board to promotion. To do so though, they will have to beat an Impero Calcio side that, much like the Metro Ford team they were in the shadow of all year, has only lost once this season across all competitions. This one should be a cracker of a match and both teams definitely have the tools to emerge victorious. However, the Legion just have not proven that they can get it done when the chips are down while Impero are treble winners, so I will have to back the Burnaby side to progress. A really tasty one here and a match that looks to be able to go either way. Sierra were the definition of second best in the Burnaby Men’s Soccer League this season and must surely now be seeing Impero Calcio in their nightmares. Not only did Impero beat them to the title by just two points but they also beat them on penalties in the Rudolph Cup final and knocked them out in the semi-finals of the League Cup. The Burnaby boys bounced back with a strong 2-0 win in their opener over a good Port Moody team from the FVSL with a resume not unlike that of Gastown from the Vancouver Metro Soccer League. Gastown were off the title pace in the VMSL’s Division 2B, finishing well back of winners Greencaps, though they did hand the Irish lads their only league loss of the season. Where the Downtown based boys struggled was with dropping points to the teams in the bottom half of the table. In fact, Gastown only managed to do the double over Shaheen, who finished in fourth, one place behind them, and Euro FC, who were second bottom and ultimately relegated to Division 3 after losing a playoff. They also were embarrassingly eliminated from the Division 2 Cup in the Preliminary Round at the hands of lower league opposition. This sort of form explains why Gastown were just barely eking into the Provincial B Cup rather than challenging for promotion. What the Vancouver club have, however, is an X-factor. Michael Long easily won the league scoring title, putting up 20 goals in 22 games, eight more than his nearest rival. Clearly Gastown are capable of beating anyone on their day, but will it be their day this weekend? Thanks to the fact that they drew one of the random byes through to the second round, Gastown have not played for four weeks. Given their performances this season, it is only reasonable to wonder if they are going to be up for this one. Sierra, meanwhile, are bang in form and looking to at least repeat, if not better, their performance from last season when they were quarter-finalists. Both teams are certainly capable of winning this match, but I’ll take consistency to carry the day here and Sierra to advance.